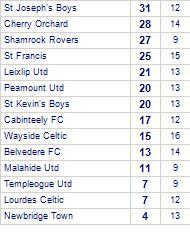 Templeogue Utd share spoils with St Francis. 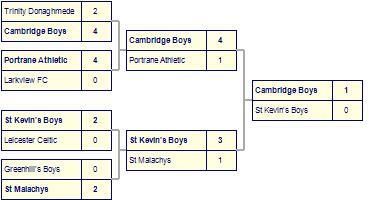 St Francis are defeated by St Paul's Artane. St Francis has yet to win in this competition, having lost all 5 games. 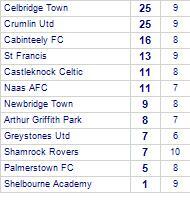 St Paul's Artane have won 3 out of 4 away games. 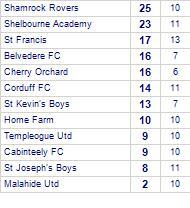 St Francis suffer defeat to Shelbourne Academy. 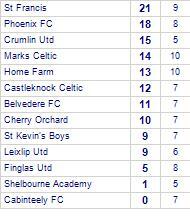 Shelbourne Academy are currently on a winning streak of 5 games. 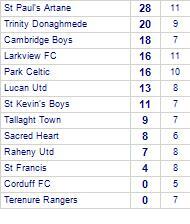 St Francis despatch Raheny Utd. Home Farm beaten by St Francis. 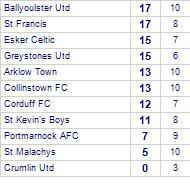 St Francis take all points from Arklow Town. St Francis take spoils against Bye. 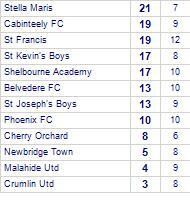 St Francis claim victory against Belvedere FC.